What makes one trail a success, while another is unpopular or the source of conflict? Why do some trails last for decades with minimal maintenance, while others require expensive repairs? Managing Mountain Biking: IMBA's Guide to Providing Great Riding gives solutions for these and dozens of other trail-related dilemmas. Written for professional land managers, volunteers, and recreation providers alike, this 256-page book offers an essential collection of best practices for planning, designing, and managing successful trail networks and bike parks. More than 50 experts - including land managers, recreation ecologists, professional trailbuilders, and experienced advocates - contributed to Managing Mountain Biking creating the most complete reference of its kind. Strategies are clearly described with the aid of 270 color photos and 25 helpful illustrations; dozens of success stories from around the globe provide real-world examples of effective trail management. Edited by IMBA veteran Pete Webber, this new book expands significantly on IMBA's popular 2004 book Trail Solutions: IMBA's Guide to Building Sweet Singletrack. It breaks new ground with advice on overcoming user conflict, minimizing environmental impact, managing risk, and providing technically challenging riding. While Trail Solutions covered trail construction, Managing Mountain Biking focuses on solving mountain biking issues through innovative trail design, effective partnerships, and visitor management strategies. The project was supported by a grant from the U.S. Federal Highway Administration's Recreational Trails Program along with sponsorship from the National Park Service Rivers, Trails, and Conservation Assistance program and the states of Pennsylvania, Tennessee, and Minnesota. The book is available exclusively through IMBA and costs $35. IMBA members receive a 10-percent discount and quantity discounts are available. 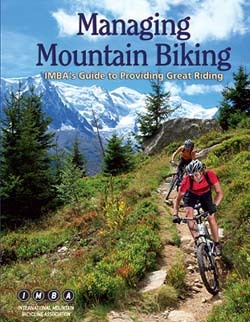 Visit IMBA's Online Store or call toll free 1-888-442-4622 to order.